Promote your school event, tackle your challenges, or get the word out about events happening at YOUR school. Email any information to gretchen@essentialmom.com. Center for Literacy Enrichment Offering ‘Homework Helper’ After-School Drop-In Program. The Center for Literacy Enrichment-Pace University is offering a new Homework Helper Program four days a week from 3:00 – 6:00 PM for students in grades 1 – 12. Certified teachers are available to help children tackle their assignments in all subjects, including complex concepts in Math and Science. The cost is $5 per session or $70 for unlimited monthly sessions. The Center is located at 78 North Broadway, White Plains, NY. For more information, contact 422-4135 or mdelany@pace.edu. What to do? Coping with issues relating to Stress, Anxiety, Depression and Mental Health. Eliminating the stigma. Byram Hills High School is proud to announce the creation of the EVEN program, designed to help teachers and students address issues relating to stress, anxiety and mental health. BHHS has worked closely with the University of Michigan for the past 15 months to create the program. Through EVEN, BHHS has been working with professionals from the UM Depression Center to provide a variety of training programs for staff and selected students. The evening will begin with an introduction on the EVEN program, a brief movie and a presentation by staff of the University of Michigan Depression Center discussing the critical importance of addressing mental health conditions in young people, with information on: Symptoms of depression/anxiety in adolescents, How to recognize the difference between “normal” adolescent moods and a more serious condition, The importance of early detection and treatment, Adolescent Suicide, Strategies to encourage open dialogue between parents, students, and teachers about mental and emotional health. The fact that mental illness is not a weakness or a character flaw, but a treatable illness, and that it is OK to ask for help. SPACE IS VERY LIMITED. Please RSVP to evenevent@yahoo.com. The Bedford Central School District 3rd Annual Elementary BIKERUN Registration opens Tuesday, March 12, 2013!! Entrance slots fill up fast. Registration for the 3rd annual BCSD Elementary BikeRun opens Tuesday, March 12th. In celebration of registration opening, March 12th is also Wear Your BikeRun T-shirt Day! We hope all previous BikeRun elementary athletes, PE coaches, leaders, volunteers, sponsors and VIP’s proudly wear their 2012 BikeRun t-shirt on 3/12! All kindergarten through 5th grade students attending BCSD elementary schools: Bedford Hills, Bedford Village, Mount Kisco, Pound Ridge and West Patent are welcome and eligible to participate. Entrance slots are on a first-come basis and are limited to 350. Due to the success of the 2012 BikeRun, registration has been increased from 300 to 350. This is a positive growth over the first year with a robust 250 participants. BikeRun will be returning to the Fox Lane campus again this year on Sunday, May 19th from 8am until noon. Approximately 1,200 attendees are expected for the “Future Fox” athletic, non-competitive, wellness, community unifying endeavor. For more information and to register go to: www.bcsdny.org/k5BikeRun2013. On February 27th, 2013 Bedford Police Chief William Hayes and the Department’s three Division Commanders, Lt. Edward Collins, Lt. Jeffrey Dickan, and Lt. Melvin Padilla attended an important school safety symposium organized by Westchester Department of Public Safety Commissioner George Longworth and the Westchester County Chiefs of Police Association. The symposium, held at SUNY Purchase, was conceived to answer many of the questions that school officials have raised in the aftermath of the Sandy Hook Elementary School shooting and to provide practical guidance for school officials on how to make their schools safer in the wake of senseless acts of violence such as the tragedy in Newtown, CT. One of the goals of the event, which is part of the county’s broader Safer Communities Initiative, is to enhance the collaboration between law enforcement and school districts. In attendance were Westchester County Executive Robert Astorino, along with dozens of police officials, school administrators, and school board members from throughout Westchester County. William Bratton, former commissioner of the NYPD and former chief of police in Los Angeles, was the keynote speaker. Bratton is well known for implementing strategies that have prevented and reduced violent crime wherever he has served. Chief Hayes stated, “Mr. Bratton’s remarks provided an insightful introduction to the seminar.” Among the topics discussed were: An Overview of School-based Violence in America, Practical Emergency Preparedness for Schools, Police Response to Dynamic Incidents in Schools. These discussions provided timely guidance and practical advice for school officials in the process of revising security procedures and updating state-mandated emergency plans. Chief Hayes said, “Our two public school districts, along with all of the private and parochial schools in the Town add up to nearly 30 schools. With so many schools and daycare facilities spread out over 39 square miles, there is clearly not a “one size fits all” solution to enhancing security at schools. I hope that those officials in attendance received important information that they can use in their preparedness efforts at their particular school. I extend my personal thanks to those school officials that attended.” For full details, view this message on the web. The Byram Hills Education Foundation, Inc. (BHEF) announced that it has awarded an Insta-Grant in the amount of $2,500. The Insta-Grant Program is a new grant initiative recently launched by the BHEF to provide immediate, short-term funding for programs and equipment that enhance learning and personal development among students in the Byram Hills Central School District. The recently approved Insta-Grant is: Teaching Non-Fiction Writing Skills Workshop, H.C. Crittenden, $2,500. Judith Hochman will conduct a seminar for H.C.C. language arts teachers about writing instruction. Her philosophy and techniques enhance how teachers instruct writing, especially non-fiction, which is essential to the Common Core and the new standards students are expected to master. She focuses on evidence-based writing strategies, but demonstrates the use of voice and rich language. She believes that teaching writing across the curriculum will enhance every student’s potential. Previously awarded Insta-Grants include: Dr. McRoy Leads the Band! H.C. Crittenden, $2,200. Grade Level National Geographic Ladder Reading Sets, Wampus, $2,500. Author Visit by Robert Lipsyte, H.C. Crittenden, $1,250. The Byram Hills Education Foundation is a not-for-profit corporation that provides financial support to the teachers and school administrators to introduce innovative programs, equipment and technologies beyond what is covered by the School District’s annual operating budget. Since its inception in 1994, the Foundation has awarded 294 grants totaling over $3 million. More information about the Foundation is available at www.ByramHillsFoundation.org. TIMELINE UPDATE regarding the Bedford Central School District Community Investment Program/Capital Plan. The BCSD Board of Education met on Wednesday, 12/12 and heard a presentations on the community feedback from the telephone & internet surveys, plus multiple Community Engagements, meetings, emails ~ representing over 1,000 communications. The phone survey is statistically important as over half of the 500 respondents do not have children within the BCSD. It also had community representative numbers of men/women from various age brackets across our 59 sq. mile District. Interestingly, over 70% of our citizens agree: People move into this area because of the reputation of the Bedford Central School District, The quality of our public schools is the most important factor protecting property values, We get excellent value in education for the taxes we pay to the Bedford Central School District, We need to keep our school buildings up-to-date and in good condition to protect our community’s investment in those facilities, We need to take whatever steps are necessary to renovate our school buildings to accommodate up-to-date teaching, curriculum, and instructional technology, When it comes to building improvement plans, it is important to include green design features for energy efficiency and sustainability, School building design features should be taken advantage of as an opportunity for students to learn about energy efficiency and sustainability. The BCSD Capital Planning Committee, Budget Advisory, Sustainability and other Citizens Advisory Committees are meeting frequently to ‘scrub’ the proposed capital plan to categorize items and prioritize their recommendations. What’s next before the turn of the New Year? The community is Invited to Attend or Watch the upcoming informative Board of Education Meeting on Wednesday, 12/19, 7pm Fox Lane Middle School Little Theater, BCSD Citizens Advisory Committees will present their line item details as well as Capital Plan Recommendations. We encourage the community to attend the Board of Education meetings to be fully informed and part of the process. Meetings can also be watched: ONLINE @ BCSD-TV: click here, Verizon Channel 1982, Cablevision Channel 18, Presentations will continue to be posted on BCSDNY.org. All members of the Bedford Central School District community are welcome and encouraged to participate in an internet survey (Nov. 26-Dec. 7) to provide feedback regarding the direction of the District as well as investments within our schools. To participate click here. BCSD will also be hosting COMMUNITY ENGAGEMENT MEETINGS — Help shape the Capital Plan and our community through your participation in a Community Engagement Session TODAY, Tuesday, December 4th at West Patent Elementary School in Bedford Hills; 9:15am or 7:30pm. The Katonah Elementary School Annual Holiday Boutique sponsored by the PTO will be held on Friday, December 7th from 5:30 – 8:30 pm at the KES gymnasium. Come join us for a fun filled shopping extravaganza featuring signed sports memorabilia, beautiful jewelry, unique clothing for kids and tweens, great children’s gifts, homemade chocolate and jams, personalized gift items and lots more! 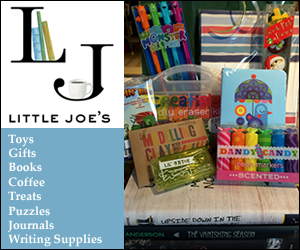 Also featuring The Kid’s Shoppe, homemade gifts by KES kids! Friday Hours: 10:00am – 3:00pm, Monday Hours: 7:15am – 3:15pm, Tuesday Hours: 7:15am – 3:15pm, Wednesday Hours: 7:15am – 2:20pm. Fox Lane Middle School, Fox Lane Campus, Route 172, Bedford, NY 10506, 914.241.6126. Please refer to the www.BCSDNY.org website to learn more about the District’s capital project needs, a proposal and course of action to address those needs, and a public engagement process to involve the community to gather input and to address questions. Information on he Capital Plan here. Information on the Community Investment Program here. 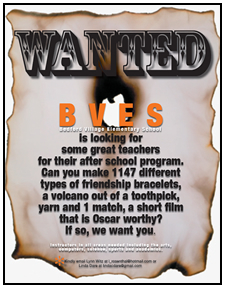 Is there life after BVES? A unique program for girls entering Fox Lane Middle School 6th grade in Fall 2012. Social Life in Middle School: Laurie Ciavardini LCSW, will discuss social issues: boy problems, girl problems, making new friends, keeping old friends, balancing school work with social activities, and so much more. Laurie has practiced in the community for over 11 years. She works with adolescents, young adults and adults. Monday, July 23 at 6:00 pm. Pizza will be served so registration is helpful! 914-234-3570, Bedford Village Library, Bedford. Caring Kids Club at Purchase School Becomes Sea Of Blue To Fight Pediatric Cancer. A wave of blue washed over Purchase Elementary School on May 31st as students wore blue to help other children suffering from cancer. Purchase Elementary School’s Caring Kids Club (led by advisors Janice Varmon, Ellen Ann Hintermeister, Anne Abrams and Chandana Neuruether) brought out the best and blue in students. Blue is the signature color of Pediatric Cancer Foundation , a not-for-profit charity whose mission is to find a cure for pediatric cancer. Caring Kids helped promote the cause all week and asked all students and staff to wear something blue and bring in a $1. The funds raised will go directly to world renowned doctors who perform research, provide treatment, purchase state of the art equipment and provide parent/patient care. Stefanie Mittman, PCF Chairman of the Board and Purchase Parent applauds the Caring Kids advisors for encouraging the students to understand how and why it is so important to “give back”. Mittman comments “It is so wonderful to see the community come together and give back to children who desperately need their help. To be able to instill the value of giving back at such a young age makes for a better world.” Caring Kids raised close to $500 for PCF. For more information on PCF logo onto www.pcfweb.org. Please join us at the 4th annual Flea Market. Would you like to have a tag sale but don’t want strangers at your house? Do you have a craft to sell? Does your child belong to a team that needs to fundraise? Saturday, June 9, 2012 (rain date: Sunday, June 10th), 10 am – 4 pm, Somers High School Parking Lot. $40 per 17’ X 8’ parking space (you may purchase multiple spaces) and/or use our dumpster for $40 per mid-sized trunk load (No Hazardous Materials). Vendor Set-up: Saturday, June 9th 7:30 – 9:00 am, DO NOT set-up before 7:30 am. Complete set-up by 9:00 am. Provide your own table & chairs. Vendor parking available. All Fees Are Payable In Advance & Are Non-Refundable — The Somers PTA reserves the right to refuse the selling of material it deems inappropriate (knives, weapons, “adult material”, etc.). * Water will be available for purchase. Find out more and register — click here.